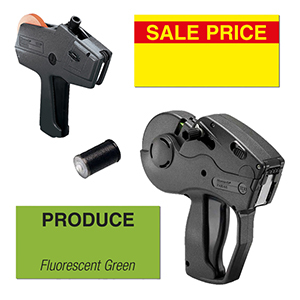 Monarch Label Guns are the largest selling price guns in the United States. American Retail Supply has been selling and repairing price guns since 1971. Monarch price labelers are incredibly versatile and ideal for pricing and coding inventory. Monarch Price Guns are made from a high-quality plastic and easily identifiable with Monarch having their own model number imprinted on to it. There are three types of Monarch Label guns. The Monarch 1110, 1130, and the 1131 price marking label guns will only print one line of information. Whereas, the Monarch 1115, 1135, and the 1136 handheld label guns will print two lines of information. Finally, Monarch 1153 label gun prints three lines of information. One-line labeler prints anywhere from 6-8 numbers on a label. Two-line labelers print anywhere from 7-13 characters or numbers on a label. Three-line labelers print a variety of information (date, price, sku, and many more) on one label. American Retail Supply offers a repair and cleaning service on most labelers. Please contact us at 800-426-5708 for more information. We offer a variety of Monarch labels that can meet any business needs. Each Monarch label is named after its corresponding price gun. We have labels that are removable, fluorescent, preprinted and even feature security slits.